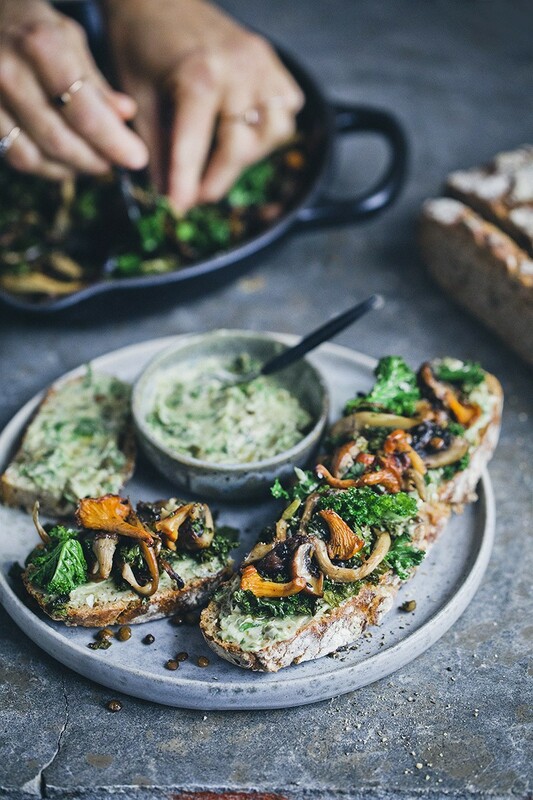 More than just a sandwich, this is better described as a warm and wintery mushroom and kale salad on top of a slice of freshly baked sourdough bread and it is every ounce as heavenly as it sounds. But before we talk more, let’s watch a movie. We have been taking an involuntary break from making our youtube videos as we have been finishing up our next book, but we are back with a bunch of new videos now. We are starting off with this sandwich this week and have a few more in the upcoming weeks. If you’ve been following my stories on instagram, you might have noticed that we’ve been picking up a new (but old) love for baking rye sourdough bread. It’s been years since we baked bread more regularly and I remember giving up the last time after having killed our third starter. Apparently (luckily), we are better at keeping children alive than sourdough starters and plants. Anyway, I felt a streak of boldness and got back on it again a few weeks back. Instead of making our own starter, we asked if we could buy a rye starter from a sourdough bakery close to us. They handed us a paper cup with a wobbly and bubbly starter and we went home and started baking. It’s been alive for a month now and whenever we are not baking, we simply let it sleep in the fridge. Many sourdough breads are complicated stories involving a checklist with tasks. This is a simpler method where we bake the bread in a crockpot to help it develop a thick crust and soft centre. It’s a version of the classic No-Knead Bread but with sourdough bread and the addition of rye flour to give it more tang. The dough is more moist than traditional bread doughs and needs longer proofing time so it develops its tangy sourdough flavor. We use 30/70 per cent rye/wheat ratio. We have been experimenting with various ratios but find that this is optimal for a bread that can rise well and still provide a lot of rye character. We have been using the bread for lunch sandwiches and this mushroom sandwich is our very favorite at the moment. It’s very very simple, you just fry mushrooms in a pan with a bit of garlic, fold down kale and cooked lentils and add a little vinegar to balance the flavors. We serve it with a herby vegan spread between the bread and the topping that we make from Zeta BreOliv, capers and parsley. BreOliv is a spreadable olive oil that can be used instead of butter. It is made from just olive oil, shea oil, water and salt. This recipe is sponsored by Zeta and you can find the recipe in Swedish on their site. And the English version below. Make the herb spread by chopping capers and parsley and stirring it together with Zeta BreOliv In a bowl. Clean and divide the mushrooms into large bits. Peel and crush the garlic. Heat a large skillet with olive oil. Add mushroom and garlic and let sizzle for a few minutes. Then add white wine vinegar. Chop the kale and rinse the lentils and stir them into the pan. Let saute until the kale has softened. Cut a few slices bread and add a layer of the herb spread. Top with the mushroom and kale mixture and a grind of black pepper. Before we make this bread we feed the starter a few hours ahead so it’s alive and kicking. Stir together sourdough, water and salt in a large bowl, and the two flours in a separate bowl. Fold the olives and the flour mixture into the sourdough liquid and use a wooden spoon to stir it into a sticky dough. Sprinkle over more flour if needed. You can also dip your hands in flour and use them if you prefer. The dough is ready when it can be shaped to a ball that is smooth on the outside and sticky on the inside. Cover the bowl with plastic and leave in room temperature for 12 hours (can be more or less depending on how warm your room is. It should have expanded at this point and be very sticky and bubbly. Fold it out on a floured table. Sprinkle extra flour on top and pull and fold the dough around itself a few times. It will be pretty sticky. Flour a proofing basket or bowl and transfer the dough to it with the folds and ends facing upwards and the smoother (don’t worry if it’s not super smooth) facing down. Leave to proof for two more hours. Set the oven to 250°C/500°F and place a Dutch oven with lid in the oven. Use oven mittens to remove the hot Dutch oven. Sprinkle the bottom with flour and carefully flip out the dough into it. Put the lid back on, place in the oven and let back for 30 minutes. Remove the lid, lower the temp to 230°C/450°F and let bake for 20 more minutes. The bread is ready when it has a neice crust and a hollow sound when tapped on. Let cool wrapped in a cloth before you slice it and it will stay moister. This post is sponsored by Zeta. All words and opinions are our own.